The Lottery is over and we now know the Hornets will own (or at least temporarily own) the ninth overall selection in a very solid 2015 Draft. But before I jump into what the Hornets should do with that pick, we need to do a little free agent housekeeping. Part II: The Free Agents – Will They Stay or Will They Go? The Hornets have just about every type of free agent on the roster and each of these players will influence the team’s strategy heading into June’s Draft and beyond. These are the straight-forward, vanilla variety free agents. Guys who played for Charlotte last season and whose contracts runs out in July. The big questions start with Mo Williams – professional NBA journeyman – who joined the Hornets midseason (his seventh team in fourteen eleven seasons) and kept them competitive once Kemba Walker went down with a knee injury. Even after Mo cooled off late in the season, Williams’ shooting and pick and roll/pop abilities were real assets on a team lacking both. In many ways, Mo’s game represents Kemba Walker’s best case scenario long-term: an above average, volume scoring point with enough distribution skills to run a team alongside a point-forward. It’s no coincidence that Mo’s best season came playing next to Lebron on the ‘09 Cavs. may decide to move on from yet another head-down iso player. In fairness to Mo, he’s the least ball “poundy” of the Lance/Gerald/Kemba/Big Al crew – but if the front office decides to go in another direction with their lead guards either in free agency, trades or the draft (Cameron Payne?) – Mo may be the odd man out. That said, my gut tells me Mo wears teal again next season; Roberts’ contract is easily movable and the Hornets will likely end up drafting a wing. As much as Coach Steve Clifford enjoyed Maxiell’s veteran presence last season as the rotation’s fourth big, there would be a guaranteed fan mutiny if Jason is brought back – simply because his mere presence would tempt Clifford to play him over Noah Vonleh. The front office, who’ve invested heavily in Noah, likely feels the same. PREDICTION: GO – VONLEH UNCHAINED! The Hornets have two veteran starters with player options for next season: opt-in and these guys play out their final contract year as Hornets, opt-out and they either re-sign new deals with the team or move on. How quickly things change. 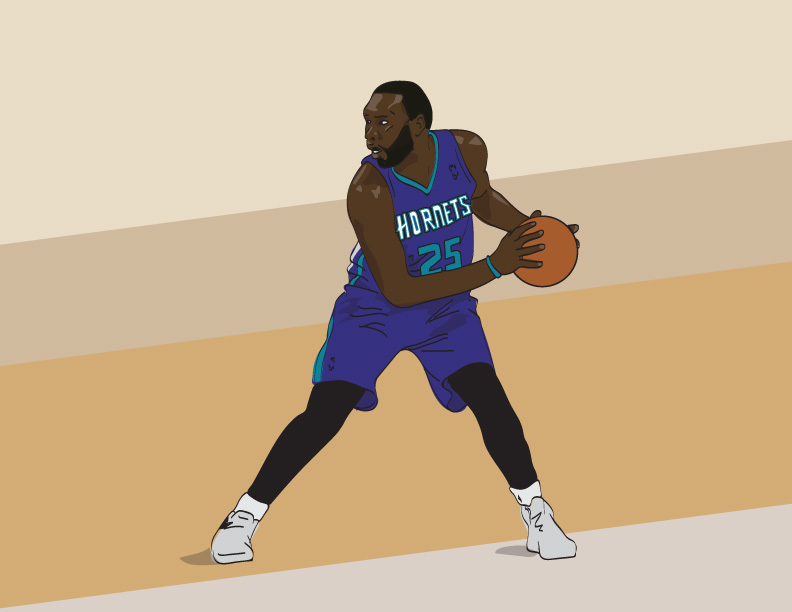 A year ago, Big Al Jefferson was a third team All-NBA center and a franchise building block who led Charlotte to its first winning season and Playoff birth in ages. But Al never fully recovered from the effects of the plantar fascia injury he suffered in last year’s sweep against the Heat. He arrived at camp out of shape and it all went downhill from there. It wasn’t exclusively Big Al’s fault. Josh McRoberts’ departure created all kinds of spacing and post entry problems. Jefferson struggled to stay upright and effective all season and you could literally see it on his face. The guy was legitimately scowling and grimacing for 65 games – sometimes out of pain, sometimes at his own teammates. With little shooting or ball movement in the halfcourt, opposing defenses keyed in on Al knowing that he was Charlotte’s only legitimate weapon. It worked. Jefferson has gone on record saying that he’ll opt-in and play the free agency game again when the cap skyrockets in 2016. That’s good news as it’ll be even more motivation for the 30 year old to drop some weight before November. If he does, we could see the return of the franchise cornerstone. If not, happy trails. Hendo had the quintessential Gerald Henderson season: he played hard on D, he hit lots of mid-range jumpers, he made great cuts and threw down some ridiculous dunks. He also showcased a much more frequent corner three (the release is slowish and he doesn’t take enough of them but it’s still great to see). He’s always been a professional. The team had him riding the pine behind Lance Stephenson for nearly two months and Hendo said nary a word. He’s a lunch pail two guard who is sorely under-appreciated by the local fanbase – mainly because his weaknesses (distance shooting, ball-handling, head-down iso drives/post-ups) have also been the team’s. Gerald turns 28 next season and his game is HIGHLY dependent on his athleticism. While other types of players his age could choose to wait for a bigger pay day in 2016, Hendo may survey the scene, see a weak free agent class and say, “screw it.” Wes Matthews’ unfortunate injury literally cost him tens of millions of dollars this summer. Gerald has always been both smart and practical. I could see him opting out and signing a nice sized deal with the Clippers, Knicks or Lakers. Doing so would free up around $6 million for the Hornets to play with. That by itself won’t buy much – but if the Hornets combine the number with, say, a strategic cut (COUGH*LANCE*COUGH) – they may have just enough cash to offer a proper “3&D” shooting guard real money on the open market. These are guys coming off the last year of their rookie deals. They are free to negotiate with any team and Charlotte has the right to match any offer. Let’s start with Taylor – and oh man, where do we start? JT is like a TV pro hoops character come to life. Meaning, he LOOKS like the prototypical NBA player but he’s not really all that good in real life. There’s lots of drama though. Tragedy in the form of his ill-timed achilles tear in 2014 and scandal in the form of his weird Detroit-based domestic violence incident that (thankfully) turned out to be more stupid than violent. Aside from being a very solid on-ball defender, there’s really nothing to recommend here. Taylor was billed as a 3&D guy coming out of Vanderbilt but his shooting numbers (32% from 3PT, 41% from 2PT) are Kemba-like. JT turns 26 next month and we still have no idea how his game will transition post-achilles long term. His $1.2m qualifying offer is basically league minimum and I could see Charlotte picking it up to give him one last shot at putting everything together. I could also see the team moving on from a fringe rotation player who made national headlines for all the wrong reasons. The real fun starts with Biz. Want to start an internet flame war? Get stat-geeks and casual fans talking about Biyombo’s merits as an NBA player. I understand both sides. The naked eye suggests that Biz should be nowhere near a professional basketball game. Four years into his career and he still has no idea what to do with the ball on offense unless it’s a dive to the rim for a dunk or an uncontested putback. Biyombo will force moves in the post that will make you laugh/cry/laugh with regularity. These forced moves are universally proceeded by an offensive rebound because there’s no way in hell a teammate is going to feed Biz with a post look; thus beginning a viscious cycle (“this is my only chance to show people my stuff!!! I don’t care if Dwight Howard is standing right over me!!!”). The real hoops smarties out there like Grantland’s Zach Lowe, At The Hive’s Frank Berndt/Bryan Mears and the Baseline’s own Bradford Coombs can paint Biz’s positives way better than I can. All I’ll say is that defensively, Biz is a legitimate game changer. He’s strong. He goes hard and he covers a ridiculous amount of territory for a center. Most importantly, he makes the paint a less friendly place for opponents. I don’t know if Biz will ever make the rotation of a legitimately good team but it could be possible in the right role. Speaking of which, unless the Hornets draft another center (Frank Kaminsky, Myles Turner, Willy Trilly Cauliflower Wonka), I’m fairly confident that they aim to bring Biz back on a second deal. That could change if another team jumps in with a real offer. There will be teams with rim protection problems that lose out on DeAndre Jordan in free agency. And if Roy Hibbert stays in Indy, a metrics-savvy, ballsy exec may say “screw it” and hand Biz $25-30 million. To the casual fan, this sounds crazy – I know. But getting a guy who can make up for the Damian Lillards’ and the Monta Ellis’s of the world is a real thing nowadays. Biz may end up getting paid. Making the proceeding free agent moves (and unloading Brian Roberts’ contract) would leave the Hornets with 11 filled roster spots minus any draft picks.